This guest blog is brought to you by Eric Lupton, the President of Life Saver Pool Fence Systems and an industry expert on pool safety. Thanks for the great information, Eric! When it comes to water safety, you can never be too careful. The danger of drowning is more prevalent than most parents think. A major realization that parents need to come to is that inevitably, even the most vigilant supervision can fail. This is when installing a pool fence in your backyard can be the most important safety decision you’ll ever make. According to the World Health Organization, drowning is the number one accidental killer of children under five. It’s terrifying, but true. In fact, drowning accounts for seven percent of all injury-related deaths. Two-thirds of the time when children are pulled from the water during a drowning incident, they’re wearing regular clothes rather than a swimsuit. This means that their parents never expected them to wander near the water. In a shockingly high amount of fatal drowning incidents, the child was last seen less than five minutes before being discovered in the pool. Being attentive to swimming children is important, but even the most vigilant watcher has the occasional blind spot. Fortunately, pool fences add a critical layer of security to your backyard. A mesh pool fence is an “isolation” barrier that is erected around the perimeter of a pool. At the most basic level, this fence provides an obstacle to prevent little ones from falling into the water. Experts and lawmakers across the nation recognize mesh pool fences as a crucial layer of protection against toddler drowning. So while you should always keep a close, attentive eye on any children, a pool fence is an extra precaution. Of course, all pool fences are not created equal. This fence needs to be strong enough to fight back when a child pushes up against it. After all, if the fence is too weak or improperly installed, it can collapse, leaving any nearby children in additional danger of falling into the pool. The fence should provide a barrier between your back door and the pool area. You’ll want to be absolutely sure that your child can’t approach the pool unsupervised, even if the door is accidentally left ajar. A pool fence should include a self-closing gate that latches automatically. This gate should close and latch itself without requiring any additional steps. Also, the latch should be high enough that it remains out of reach from curious children. The fence should be 48 inches tall with slats no more than four inches apart. The higher the fence, the better. This barrier should be too tall for a little one to climb over. When it comes to young children, the highest possible fence is the smartest choice. The fact is, installing a pool fence can be the most important decision you ever make for your family’s safety. That said, it’s not a catch-all safety measure either. The fence will become most effective when other safety precautions are also taken. Lock any doors and windows that provide access to the pool. Keep these locks high so that little hands can’t bypass them. Install an alarm inside the pool, as well as an extra alarm that should be worn by the child. Swimming lessons are important for everyone! This includes both kids and adults. After all, it’s never too late to learn how to swim. Children should be trained as early as you and your pediatrician feel comfortable. Infant swim instructors start training babies to roll over and float earlier than you might think. CPR training can be invaluable. An adult trained in CPR can mean the difference between life and death. The idea behind these layers of protection is to keep children as safe as possible. Each additional layer of protection will significantly reduce the possibility of a drowning tragedy. When used alongside a pool fence, these layers of security can provide parents with much more peace-of-mind. Eric Lupton is the President of Life Saver Pool Fence Systems, Inc. He is highly sought after and interviewed by the media as an expert on pool safety. Eric is a native of Boynton Beach, Florida, and loves Doctor Who, TED Talks and everything dairy. 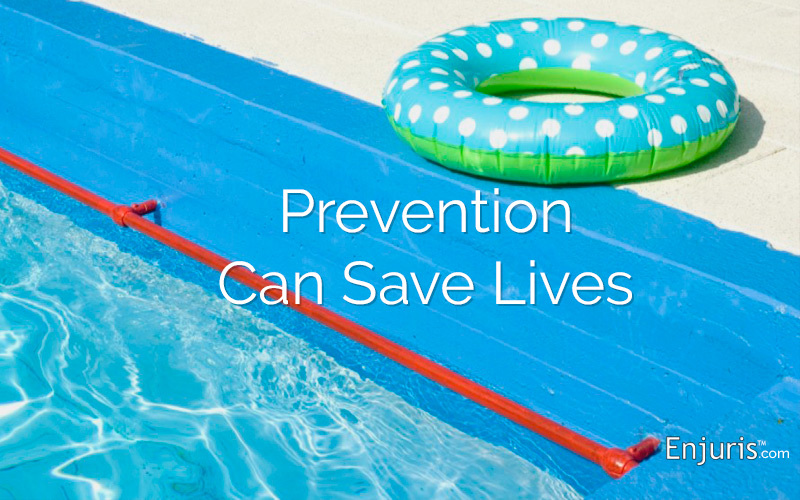 Did you know Enjuris partners with Pool Safely to help prevent child drownings? The Pledge is a call-to-action for everyone to commit to specific steps to be safer in and around the water. Kids will pledge to never swim alone, ask for swim lessons and stay away from drains. Adults will pledge to always designate a water watcher, learn CPR, make their kids know how to swim, remove portable pool ladders when not in use and ensure their pools have proper fencing, gates and drain covers. 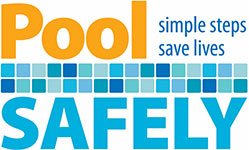 Visit PoolSafely.gov/pledge to electronically sign the Pledge or to request a hard copy.